In the painting “Sun Eagle Fly,” a bird representing both Spirit Owl and an Eagle flies toward us carrying a snake in his talons. The snake is food for sustenance; it is also symbolic for the serpent, which lies at the base of our spine waiting to awaken, the divine kundalini rising us into higher consciousness. The Snake also sheds its skin, which is seen as a symbol of death and rebirth and with this rebirth he brings in the alchemy of new perspectives with wisdom and understanding. The eagle is a messenger from God and the personification of the spirit of the sun. In myth he flies so high he touches the sun and dives into the ocean waters cleansing in a purification act The eagles symbol is one of great power and illumination, new vision, bringing higher wisdom and clarity. 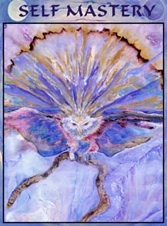 Eagle medicine in the painting increases a certain sense of responsibility in bringing in a higher power. The fire of the sun and the sacred waters are opposite elements that here in the painting are brought together with the eagle for igniting peace on planet Earth for healing humanity’s insanity and creating a sustainable harmonic future. A new beginning. The spirit of the stag opens the doorway to a watery, misty underworld; Women travel from this underworld bringing vessels filled with medicine from the deep to heal the subconscious wounds that lay low in that realm. They travel on the stairway that leads towards the surface to the sun. The stag antlers symbolize balance and a connection to the Divine. The stag denotes the ability to shape shift into other dimensional realms and the medicine is physically powerful as it inspires compassion and gentleness with unimaginable strength. Ride the snake still and coiled… in your spine at the base. Sun and eagle guides your way… as you seek find a new space. Use your powers gift to fly do not cower, master your mind. Ray of light strong and bright, sun and eagle soar in flight. The art of Self Mastery indicated in “Sun Eagle Fly” is medicine in learning how to select our thoughts, just as we choose what we will wear each day. This is a power that can be cultivated. Working on the re-training of our mind is the only thing that is worthwhile trying to control. Drop all other ideas of control but that! For, if we don’t learn the art of Mastery of the mind we will consistently be falling in a cavernous pit into the underworld endlessly feeling lost. It is impossible to be in control of our physical world. The task suggested before us is to master our inner response to our external world, our thoughts and emotions, that’s why it’s called Mastery. The watery underworld suggests emotional flux triggered from the subconscious. There are times when we can feel angry or frustrated when challenged. During this time, we need to be aware we are being tested, view it as simply information, take a breath and prepare to deal. Knowing we can call upon the resources to transform these challenges into the Self Master of wisdom is a breath of ocean breeze. A trained and mastered mind is powered by intuition; by consciously turning it on and keeping it proactive. Soaring like an eagle above it all as an observation point of view, rather than being in the thick of it caught in the emotional body trauma is a gift. The eagle is here to bring this core part of our being that is pure spirit, a spark of the Divine into more awareness. In the realm of Spirit, there is no division all is one in the Divine. As we observe our thoughts and emotions from this divine part of our being, we will begin to know peace as a master of our mind. We are now reaching an auspicious part of our life in the history of humankind, where we cannot allow our selves to be fooled by anything out of integrity with Divine Will and our soul agreement any longer. We may feel scattered sometimes, and we may have moments where we feel forsaken by the Creator. Still there is no wiggle room for anything else anymore, no fantasies, projections, and false illusions of self or what our life should be or look like. The sky is bursting with energy for new beginnings on the horizon over the ocean and rays of the sun emanate from the crown of the eagle in flight. Sun Eagle Fly is here to remind us to be a conscious anticipatory Creator in the new world design.